Cultural Compulsive Disorder: It's The 4th Annual CCD Block Party... And You're All Invited!!!! It's The 4th Annual CCD Block Party... And You're All Invited!!!! It's that time of year again... the time when the CCD family gathers together down in Coney Island for a day of SUN, FUN, LIVE MUSIC & ART... It's the 4th annual CCD Block Party!!!! 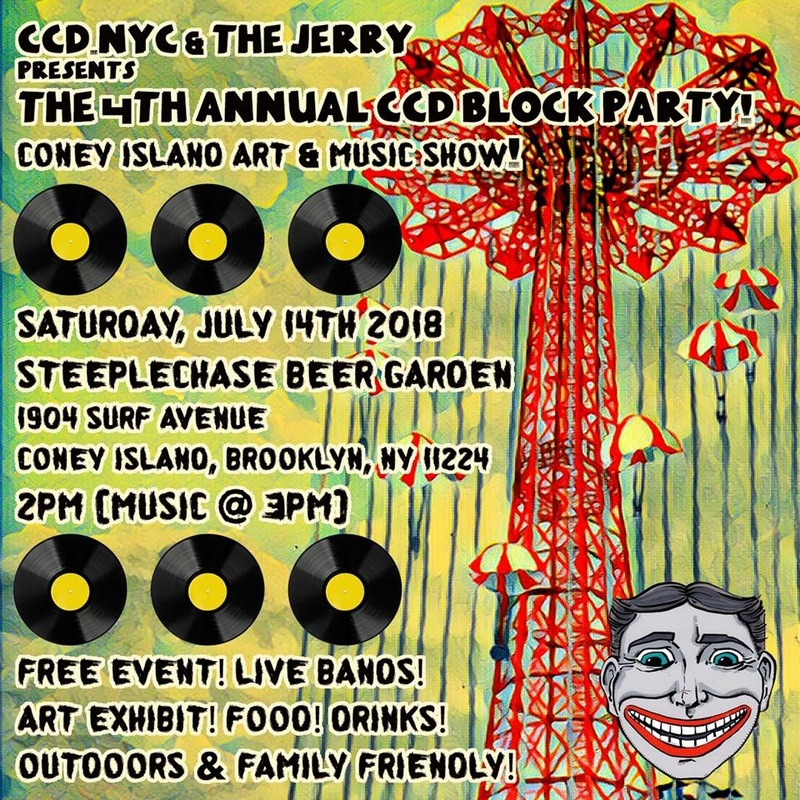 Join us as we team with The Jerry once again at Steeplechase Beer Garden (1904 Surf Ave at the base of the Brooklyn Cyclones stadium) starting at 2pm for a day FILLED with local music & art. 7 Bands performing LIVE!!!! Over 20 artists displaying their own creations where they RE-IMAGINE great album covers of the past. Obnoxiously large cold beers & drinks, delicious food and of course we are only ONE BLOCK from the beach... what more can you ask for on a summer Saturday? PLUS THE VENUE IS FAMILY FRIENDLY... BRING THE KIDS!!! You can find directions & additional information by clicking on the Facebook Event Page Link here. A group art show & live music event! 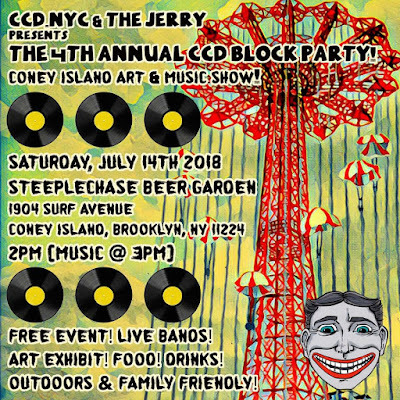 Kicking off at 2pm at the STEEPLECHASE BEER GARDEN, this all-day-and-night, FREE, family-friendly event will be a celebration of art and music, as CCD’s artists will exhibit reimagined & redesigned vinyl album covers from some of your favorite bands... alongside a slew of live performances by local bands... all in Coney Island, Brooklyn! Food! Booze! Art! Music! Sun! Fun! The CCD block parties have become a summer tradition, and they’re always a huge amount of fun! And if you’ve been to any of The Jerry’s Coney Island shows, you’ll know he packs them with a ton of talented bands! It’ll be a day you won’t want to miss!!! 2pm opening. 3pm bands begin.